Flexpod Universal Scissor Mount is a great solution for almost every Smartphone on the market. However, the Scissor is best for gripping phones over 2 inches but less than 3 inches wide. In order to fit, most phones will need to be out of their cases. Kit includes the Scissor Cradle and Mounting Bracket for the right side of the Tachometer. The Pro Series Mount is easy to install, and gives you the freedom to choose what angle your smartphone is mounted at. The Scissor Module uses rubberized pegs and a spring loaded cross-grip design that pinches your phone, keeping it in place. You can adjust the device within it's grip to avoid buttons or allow access to plugs on any side of the device. This mount can also be rotated 90 degrees to hold your smartphone horizontally. Works with the new iPhone6! Our XXL mount is designed specifically for large devices, with or without case, and can safely hold almost anything up to 4 inches wide. It provides a "Kung Fu" grip so your smartphone or tablet won't go anywhere. The Smartphone FlexPod attaches directly to the back of every MINI tachometer. It features a light yet robust frame with two responsive, spring-loaded arms and four rubberized pegs to create a firm grip on your device. The FlexPod Pro has an adjustable arm, allowing you to fix the position of your phone where you’d like. - EASY Install - DOWNLOAD PDF Instructions Here. Magnet - We had long been skeptical of magnetic phone mounts, but it turns out they are pretty awesome. Since most of us have a protective case on our phones, sliding the included little plate inside the case makes for an excellent magnetic connection between the device and the mount. This magnetic mount is so quick and easy to use it is our recommendation for a daily driver. Your device is so much more than a phone. We use our smartphones as advanced GPS devices with turn by turn directions and traffic avoidance. These crazy valuable features of your phone are really tough to take advantage of unless you have the phone secured where you can see it. This Gemini puts your phone in a better viewing location than any other car phone mount could; it attaches to existing holes on the back of your tachometer. Once installed the phone location can be adjusted easily by pivoting the on the bracket, just move it and it stays put. The Gemini Mount will then allow the phone to rotate into portrait or landscape mode. Comes as a pre-assembled kit that will bolt on and face to the right of the tach (works on US LHD or Euro RHD). The bracket is made from steel and powder coated black. The color will not fade over time or scratch unless you really try hard. Scissor - Cravenspeed designed the first version of this phone holder 10 years ago. Universal phone holders tend to be bulky, clumsy and cheap plastic; this is a simple, machined aluminum design that (with a size upgrade for 2019) can fit any phone on the market. These phone holders are assembled by hand in our shop and they are a little more expensive than the magnet. The scissor has a stronger grip on the phone than the magnet does. The Scissor is best for gripping phones over 2 inches but less than 3 inches wide. Flexpod Universal Scissor Mount is a great solution for you if you don't see a model specific cradle, OR HAVE A CASE on your iPhone, Android, Galaxy S or other device. Kit includes the Scissor Cradle and Mounting Bracket for the right side of the Tachometer. - DOWNLOAD PDF Install Instructions Here. See all Flexpod Products here. Works with most new iPhones and Smartphones! It opens up to 4 inches wide, so as long as your device is narrower than that, it will fit just fine. The Gemini XXL mount is designed specifically for large devices, includes a magnetic mount and a clamshell mount. You choose which you like best, and you can switch at any time. Either will work for any smartphone no matter how large or small. The magnetic mount provides a quick and easy way to mount your smartphone. The clamshell holder is more secure for rough roads or on the track. YOU have the choice! We've long been skeptical of magnetic phone mounts, but it turns out they are pretty awesome. Many of the phones we tested were sufficiently magnetic on their own to just attach right to the mount. If not, we include two sizes of metal plates with adhesive backing. You could stick one to your phone, but if you use a case, it just goes between the case and the phone and works beautifully. While this magnetic mount is quick and easy to use, if you do not want to deal with the plates and your phone does not attach without them, the XXL Clamshell Clip is in the box for you too. The strong spring of the included clamshell holder can be more secure than the magnet mount if you are really putting it through its paces. This is ideal for larger/heavier devices or bumpy driving conditions. The spring clip design means it’s still easy to use, simply pinch the back to open the holder. It opens up to 4 inches wide, so as long as your device is narrower than that, it will fit just fine. When removing your phone from the holder you should avoid letting the strong spring snap shut. Over time, this can cause the holder to break. If your holder breaks we will replace it, but this can be easily avoided. 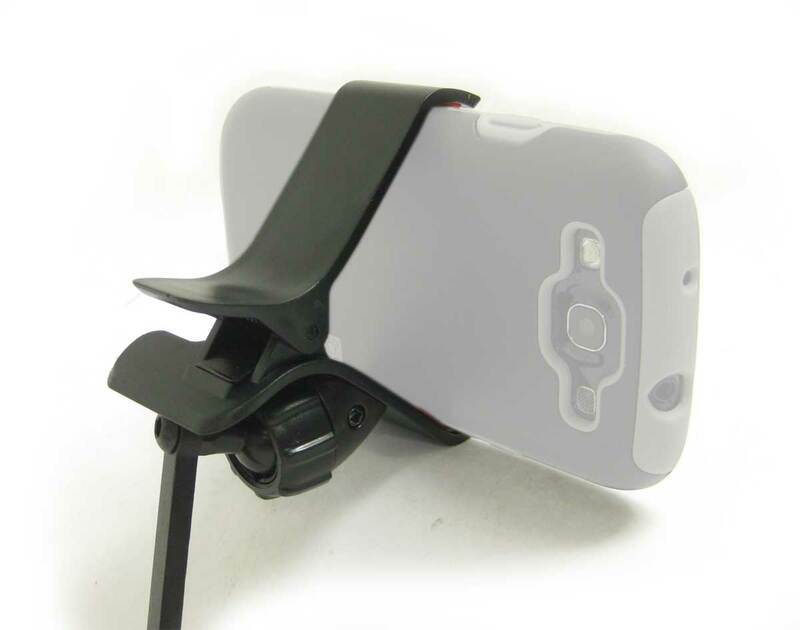 The Gemini Mount has an adjustable arm, allowing you to fix the position of your phone and rotate where you’d like. Bigger, Faster, Stronger for your MINI of course. Works with the new iPhone 7 & 7 Plus! Our XXL mount in BLACK is designed specifically for large devices, with or without case, and can safely hold almost anything up to 4 inches wide. It provides a "Kung Fu" grip so your phone won't go anywhere. Our XXL mount in BLACK is designed specifically for large devices, and can safely hold almost anything up to 4 inches wide. It provides a "Kung Fu" grip so your smartphone or tablet won't go anywhere. The XXL Module is designed specifically for large devices, with or without case, and can safely hold almost anything up to 4 inches wide. It provides a "Kung Fu" grip so your smartphone won't go anywhere. Click here to see all compatible MINI Cooper phone mounts. The Flexpod Universal Scissor Mount is best for gripping phones over 2 inches but less than 3 inches wide - with or without case. Perfect for most new iPhone, Android, Galaxy S or other device. Kit includes the Scissor Cradle and Mounting Bracket. Compatible with Chrono and Navigation packages where tach and speedo are located on the steering column. Works with today's bigger smartphones and mini-tablets! Our XXL mount is designed specifically for large devices, with or without case, and can safely hold almost anything up to 4 inches wide. It provides a "Kung Fu" grip so your phablet won't go anywhere. This may be our barebones model, but it does exactly what you need it to do. You mount, literally, any phone in a optimal position for viewing for less than $50. The ball and socket joint allows you to adjust the viewing angle to avoid glare. You can also rotate the device from landscape to portrait. Works with today's larger phones up to 4"! NOTE: This phone holder fits the F60 Countryman, however due to the proximity of the tach to the dash, this phone holder will limit the vertical adjustment range of the tilt-wheel feature. The strong spring of the inclued clamshell holder can be more secure than the magnet mount if you are really putting it through it's paces. This is ideal for larger/heavier devices or bumpy driving conditions. The spring clip design means it’s still easy to use, simply pinch the back to open the holder. It opens up to 4 inches wide, so as long as your device is narrower than that, it will fit just fine. When removing your phone from the holder you should avoid letting the strong spring snap shut. Over time, this can cause the holder to break. If your holder breaks we will replace it, but this can be easily avoided. This complete kit securely holds your precious device. It opens up to 4 inches wide, so as long as your device is narrower than that, it will fit just fine. This mount can also be installed on the right side or left side of the tachometer - your choice! The Gemini XXL mount is designed specifically for large devices, and is both a magnetic mount, and a clamshell mount. You choose which you like best, and you can switch at any time. Either will work for any smartphone no matter how large or small. We've long been skeptical of magnetic phone mounts, but it turns out they are pretty awesome. Many of the phones we tested were sufficiently magnetic on their own to just attach right to the mount. If not, we include two sizes of metal plates with adhesive backing. You could stick one to your phone, but if you use a case, it just goes between the case and the phone and works beautifully. While this magnetic mount is quick and easy to use, if you do not want to deal with the plates and your phone does not attach without them, the XXL Clamshell holder is in the box for you too. These simple instructions for the Flexpod XL Scissor and XXL Clamshell Smartphone mount let you have heads up, hands free use of your smartphone in your MINI Cooper. Attaches to the back of your tachometer. The XXL works with the iPhone! Call us today! Our XXL mount is designed for large devices, with or without case, and can safely hold almost anything up to 4 inches wide. The ball and socket joint allows you to adjust the viewing angle to avoid glare. You can also rotate the device from landscape to portrait. Call now for more information! Keep your hands free with this smartphone mount for your MINI. Adjust the angle, swivel to horizontal or vertical, and off you go! These instructions also cover the optional Hidden Wiring Kit. The product is made from the highest grade materials and is guaranteed to be free from defects. Mini Cooper Phone Mount Holder Application Guide for securing your smartphone or small tablet in you Mini Cooper. Every MINI owner knows how frustrating it attaching your iPhone or Smartphone holder to your MINI. We've got the secret. Read on! Mini Cooper Phone Mount Holder - Fixie XXL Installation Instructions. Simple cost effective solution for mounting your smartphone in your MINI, with our without a case!